The Hallite 839N double-lipped, snap-in wiper is designed to fit popular Asian housing sizes, and to exclude dirt and moisture from entering the cylinder. The design minimises the oil transfer out of the ram on the cylinder rod by collecting traces of fluid passing the rod seal. 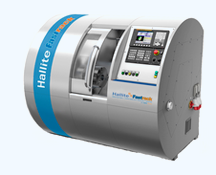 The wiping lip on the Hallite 839N is textured to provide improved dry rod performance, particularly for long stroking cylinder applications. Opposite the wiper lip are two sealing lips that are precision trimmed at an angle to give optimal rod sealing performance. The Hallite 839N is designed to have an interference in the seal housing groove to improve the stability of the wiper in the gland and to reduce the possibility of ingress around the outside of the wiper. The Hallite 839N is precision moulded in Hythane® 181 for maximum wear resistance. Hallite recommends a vent is provided between the seal and the wiper to avoid a pressure trap.